Your child’s dental experience can determine their outlook on dentistry in taking care of their teeth for a lifetime. From the moment your child enters our office, they will be welcomed and nurtured. We are dedicated to providing comprehensive pediatric dental and orthodontic care in a comfortable environment. Our reception room is designed to be relaxing for parents and your children will find their area to be the same. They will have a dedicated movie room with individual video game stations. We welcome parents to be present in the operatories for the initial examination. In there your child will find individual ceiling monitors with wireless headphones for those patients who prefer watching movies during treatment. Your child will know that they are at a place just for them. We believe that the parent plays an integral role in the treatment plan and you will be given thorough oral hygiene instructions in order to participate at home in your child’s care. 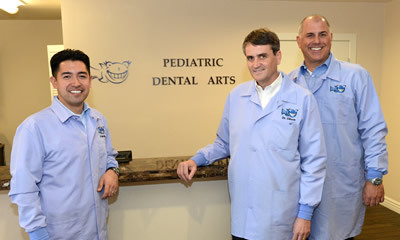 We are privileged to have the opportunity to provide dental care to your child and grateful for the confidence you have in Dr. Fishman’s Pediatric Dental Arts.